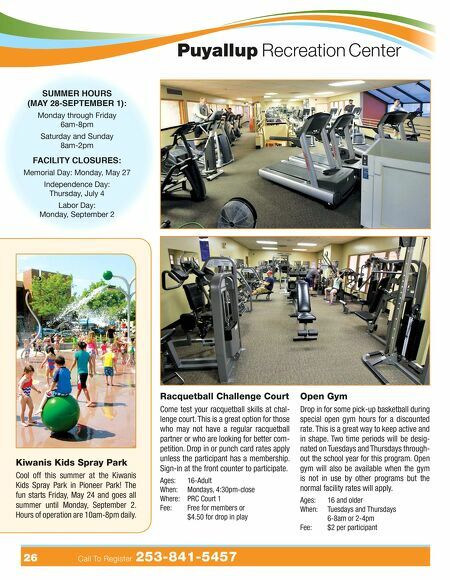 26 Call To Register 253-841-5457 Puyallup Recreation Center SUMMER HOURS (MAY 28-SEPTEMBER 1): Monday through Friday 6am-8pm Saturday and Sunday 8am-2pm FACILITY CLOSURES: Memorial Day: Monday, May 27 Independence Day: Thursday, July 4 Labor Day: Monday, September 2 Racquetball Challenge Court Come test your racquetball skills at chal- lenge court. This is a great option for those who may not have a regular racquetball partner or who are looking for better com- petition. 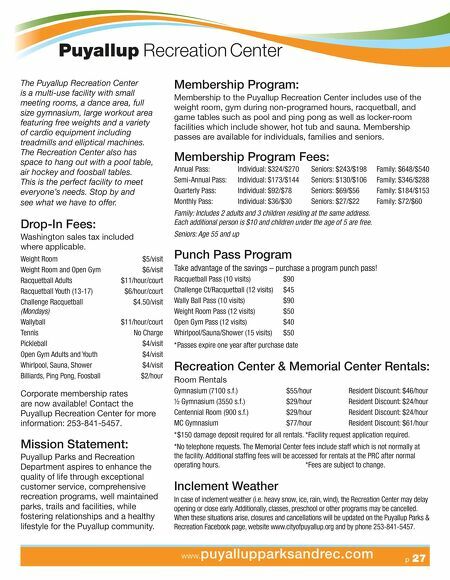 Drop in or punch card rates apply unless the participant has a membership. Sign-in at the front counter to participate. Ages: 16-Adult When: Mondays, 4:30pm-close Where: PRC Court 1 Fee: Free for members or $4.50 for drop in play Open Gym Drop in for some pick-up basketball during special open gym hours for a discounted rate. This is a great way to keep active and in shape. Two time periods will be desig- nated on Tuesdays and Thursdays through- out the school year for this program. Open gym will also be available when the gym is not in use by other programs but the normal facility rates will apply. Ages: 16 and older When: Tuesdays and Thursdays 6-8am or 2-4pm Fee: $2 per participant Kiwanis Kids Spray Park Cool off this summer at the Kiwanis Kids Spray Park in Pioneer Park! The fun starts Friday, May 24 and goes all summer until Monday, September 2. Hours of operation are 10am-8pm daily.